Mexican-inspired, Dallas-based brand Mi Golondrina and online children's boutique Maisonette will release their colorful collaboration this Saturday. We Dallasites are blessed with many an adorable kids’ store, from The Tot to Madre, filled with giftable goods. 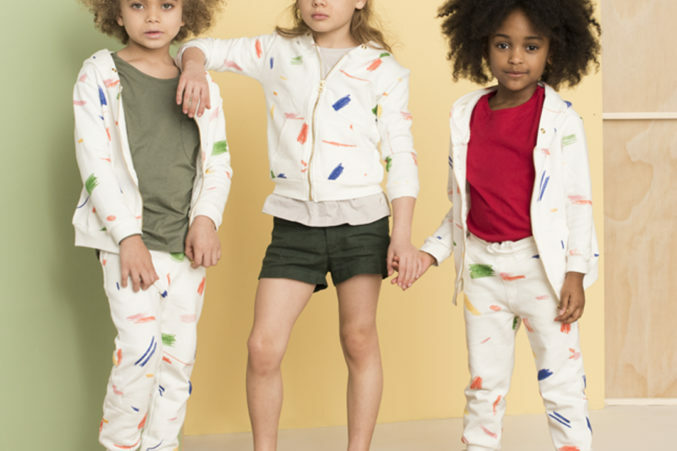 Nationally, it’s far harder to scope out stylish kids’ clothes; online boutique and lifestyle brand Maisonette aims to fill that gap in the market for moms by offering a one-stop shop for curated, chic clothes and goods for babies and children. The site also serves as an editorial platform filled with parenting advice from physicians, anecdotes from celebrity moms, and style tips from Maisonette’s team–fitting, as the brand’s founders, Sylvana Ward Durrett and Luisana Mendoza de Roccia, have stints at Vogue on their resumés. When the duo realized that Maisonette’s customer base had a strong presence in Dallas, they turned to Dallas brand Mi Golondrina and inquired about collaborating. “We’ve been admirers of the brand for quite some time so it was a dream come true [to work with them],” says Maisonette. Known for their handmade, Mexican-inspired clothing and home goods, Mi Golondrina (“swallow” or “songbird” in Spanish) collaborated with Maisonette to create bright, colorful dresses and rompers with floral embroidery. The trunk show’s offerings will also feature pieces from Maisonette’s other favorite Dallas-based brands, including Gaia and Folklore Las Niñas. We asked Durrett and Mendoza de Roccia to share exclusive details about the event, their summer must-haves, and their favorite gifts for moms and kids alike. What can attendees expect from this trunk show? After the successful launch of our holiday and Hamptons pop-ups last year, we began to experiment more with targeted trunk shows for smaller groups of moms across New York City and have seen real success with that model. Our customer likes to engage with us and our exclusive product in person. Visiting [our] key markets, like Dallas, allows us to connect with current and budding shoppers, explain who we are and tell our story in-person. Our customers are parents who love to share great finds with their friends and we are looking forward to being that find that they pass along to friends. What are some of Maisonette’s summer must-haves? The summer season always brings about fun adventures for our families; we are looking forward to continuing the tradition of getaways with all the kids in Nantucket and the Dominican Republic. Our Maisonette x Mi Golondrina Gingham Print Bubble Romper and Print dress will definitely be packed in our suitcases for our girls, along with our exclusive Mott50 x Maisonette Mommy and Me swim capsule – the print is so fun and made with a UPF 50 material to keep [us] protected. Maisonette is known for its expansive selection of goods that make perfect presents. What are your go-to recommendations for gifts for kids (or moms)? Gift sets are definitely our go-to recommendation. They are effortless, cost-efficient and provide versatility. We recommend our recently launched Maisonette Doodle Collection that we designed after our kids’ first works of art. The sets of onesies, bibs, blankets, hoodies, and bottoms are available in three different prints and are available in sizes from newborn to 12. For mom, we recommend our Monica Rich Kosann fine jewelry locket pieces. They are both contemporary and timeless and are inspired by the idea of keeping our minis nearby.